For centuries, people have referred to our earth, the planet upon which we live, as "mother earth." In nature, seeds germinate in fertile soil to become giant trees, crops of our fields, or the humble grass we walk on. We don't even think about the air we breath, but we couldn't live without it. The soil and waters of earth grow the food we eat. The gravity of earth holds our feet firmly on the ground. Without the gravity of our mother earth, we would float out into outer space and be lost. Our lives depend entirely upon the fortitude of our mother earth. From space, earth appears as a beautiful jewel shining in the light of the sun. Our lives depend so much on mother earth that most of the time we take her for granted, but some people even worship her. It would seem that mother earth indeed is the source of all life upon it. Seeds germinate in its soil, fish lay their eggs in the sea and hatch to fill the oceans with life. Our very own bodies are made from mother earth -- made from the minerals taken up in the plants that we eat. And when we die, our bodies disintegrate into soil once more to provide the fertilizer for yet another life to begin its life's journey in the light of the sun. Yet science has utterly been unable to generate life from lifelessness. It seems to be an indisputable law of the universe that only life can beget life. Therefore, it is a logical assumption that our earth must be alive in order for it to beget life on and within it. Indeed, God's revealed word to man indicates that our earth is alive. It appears that God would have us know that our earth upon which we live is actually a living being. This is not a new idea. The indigenous people of many lands believe to this day that the earth is alive. For example, the American Indian treat the earth with great respect because they believe it is alive. Is there any scriptural or scientific evidence that would indicate that our earth is alive? Believe it or not, there is an abundance of this evidence. Not that the earth should be worshiped like many ancient peoples apparently did when they worshiped the earth, the sun, the moon and stars. But at least, this knowledge should generate within us a deep respect for the planet upon which we live which provides us our home in the vastness of space. The scriptures do indicate that our "mother" earth is alive. In the scriptures, we find that the Earth has many characteristics of a living being. It has a mouth, a womb, a heart, a navel, with openings into it's interior, breathes, and can even "speak" as an intelligent being. Indeed, the scriptures when describing the earth, describe a hollow planet with polar openings and an interior sun with people living throughout its entirety -- on its outer surface, within it's shell, on it's inner surface and within the interior sun. As all living beings, the earth was "born" spiritually first, and then came into existence physically second. It acknowledges the existence of its creator, God, and "obeys" God's celestial law. As a righteous living being, the Earth underwent a baptism of immersion in water at the time of Noah's flood. At the beginning of the millennial reign of Jesus Christ upon the Earth, it will undergo a baptism of fire, and at the end of it's temporal existence, the earth will "die" and be brought forth in it's resurrected form as a celestial kingdom to be inhabited in the eternities by those of its inhabitants worthy of a celestial glory. All life had it's genesis with God. Jesus Christ is the creator of heaven and earth -- the Great "I Am," who revealed himself to Moses. And all living things were created first spiritually before they were created temporally upon the earth. In Genesis 2:5, we learn that "every plant of the field before it was in the earth, and every herb of the field before it grew" were created first spiritually before they were created physically upon the earth. All living beings, including the earth, have a spirit body, as well as a physical body. Jesus Christ revealed to the prophet Joseph Smith, "that which is spiritual being in the likeness of that which is temporal; and that which is temporal in the likeness of that which is spiritual; the spirit of man in the likeness of his person, as also the spirit of the beast, and every other creature which God has created." (Doctrine & Covenants 77:2) It is the spirit within each living being that gives it life. When that spirit leaves the physical body at death, then that body becomes life-less. What's more, it is evident from the scriptures that the spirit of every living thing had parents in Heaven that gave it life. Concerning our heavenly parents, the scripture states, referring to Our Father in Heaven, "Furthermore we have had fathers of our flesh which corrected us, and we gave them reverence: shall we not much rather be in subjection unto the Father of spirits, and live?" (Hebrews 12:9) And Christ told his disciples to pray to "Our Father which art in heaven..." in which Christ is telling us that we all have a father in heaven -- the father of our spirit bodies, and if we have a father, we also, of course, have a mother in heaven, -- for wherever was there a father without a mother? Even so, if our earth is a living entity, it must also have a spirit that gives it life. Indeed, it is so, for the spirit world of this earth is where the spirits of all men go at death. The Mormon Apostle, Bruce R. McConkie, in his book, MORMON DOCTRINE wrote, "The spirit that enters the body at birth leaves it at death, and immediately finds itself in the spirit world. That world is upon this earth." (MORMON DOCTRINE, p. 68) Since the spirits of all living entities have the same shape and appearance as their physical bodies, so the earth's spirit world has the same shape and form as it's physical body -- and is what makes the earth alive. Joseph Fielding Smith, the great nephew of Joseph Smith, stated that, "This earth is a living body." (DOCTRINES OF SALVATION, Vol. I p. 72) As a living body, the earth actually obeys God's commands. It is a mortal being and will die and be resurrected the same as all of us by the power of Our Lord and Savior Jesus Christ. As revealed to the Prophet Joseph Smith, "And again, verily, I say unto you, the earth abideth the law of a celestial kingdom, for it filleth the measure of its creation, and transgresseth not the law. Wherefore, it shall be sanctified; yea, notwithstanding it shall DIE, it shall be quickened again, and shall abide the power by which it is quickened, and the righteous shall inherit it." (D&C 88:25, 26). As a living being, our earth has a spirit -- it is the spirit world where all men go at death. That spirit world had it's beginning in heaven as did the spirits of all men. The earth was created spiritually in heaven before being created physically here in our solar system. If the earth's spirit were created in the presence of God, most likely it was created in His world. God, our Heavenly Father's planet is a star in the center of our Milky Way Galaxy. The largest stars are located in the center of the galaxy and control all the other stars throughout the galaxy by reason of their great size, mass and central position. This was revealed by God to Abraham, "And I Abraham, had the Urim and Thummim, which the Lord my God had given unto me, in Ur of the Chaldees; And I saw the stars, that they were very great, and that one of them was NEAREST UNTO THE THRONE OF GOD; and there were many great ones which were near unto it; And the Lord said unto me, by the Urim and Thummim, that Kolob was after the manner of the Lord, according to its times and seasons in the revolutions thereof; that one revolution was a day unto the Lord, after his manner of reckoning, it being one thousand years according to the time appointed unto that whereon thou standest. This is the reckoning of the Lord's time, according to the reckoning of Kolob." (ABRAHAM, The Pearl of Great Price, 3:1-3) Verse 9 clarifies that it is Kolob that governs our galaxy wherein our earth resides: "And thus there shall be the reckoning of the time of one planet above another, until thou come nigh unto Kolob, which Kolob is after the reckoning of the Lord’s time; which Kolob is set nigh unto the throne of God, to govern all those planets which belong to the same order as that upon which thou standest." In the explanation of Facsimile No. 2 in the book of Abraham, Figure 2 says, "Stands next to Kolob, called by the Egyptians, Oliblish, which is the next grand governing creation near to the celestial or the place where God resides...Fig 4...the time of Oliblish, which is equal with Kolob in its revolution and in its measuring of time." 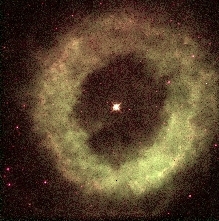 Therefore, as revealed through Abraham, at the center of our Milky Way Galaxy which is "the same order (in the same galaxy) as that upon which thou standest," are two stars of gigantic size, in rotation about a common center of gravity -- a double star system with the rest of the galaxy rotating about them. Both Kolob and Oliblish are the same size and take 1,000 of our earth years to complete one rotation or day. Oliblish "...is the next grand governing creation near to the celestial or the place where God resides..." and Kolob is the "...nearest unto the throne of God." Therefore, I conclude that the throne of God is INSIDE Kolob and Kolob is HOLLOW as are all stars and planets. In fact, the stars ARE planets -- the planets of the Gods. R = a planet's distance from the sun in astronomical units. One AU equals 93,000,000 miles, the average distance from the earth to the sun. V = 1 divided by the square root of R.
From this, we can deduce that the distance to Kolob's outer surface from God inner throne, "...the celestial or the place where God resides..." would be 100 astronomical units, or 9.3 billion miles. That is 2.5 times the distance from the sun to the planet Pluto. The diameter of Kolob and its companion double star then, would be about 18.6 billion miles -- plenty of space could be found within its hollow interior for the creation of planets. Since spirit beings are the offspring of celestial parentage -- just as the human race has celestial parents of their spirits, it is logical to assume that the earth's spirit body would have celestial parentage also -- that being the planet of Our Heavenly Father and His Throne in Kolob at the center of our galaxy. Just as our physical bodies were created on this earth, the Earth's physical body probably also originated within our own solar system -- a best guess would be the planet Uranus. One of the physical characteristics the scriptures give in describing our planet earth as a living entity, is that it has a "womb" within it, and that our earth is the "mother" of mankind and can actually utter words. In the Book of Moses, Chapter 7, verse 48, we read, "And it came to pass that Enoch looked upon the earth; and HE HEARD A VOICE FROM THE BOWELS THEREOF, saying: Wo, wo is me, THE MOTHER OF MEN; I am pained, I am weary, because of the wickedness of my children. When shall I rest, and be cleansed from the filthiness which is GONE FORTH OUT OF ME? When will my Creator sanctify me, that I may rest, and righteousness for a season abide UPON MY FACE?" Thus Enoch testified that the earth is an intelligence living entity that he heard speak words. In recent decades with the mapping of earth's sea floor, it appears that our "mother" earth is expanding, and even has stretch marks in many places on the ocean floor, and many continents appear that they could have at one time fit together as the scriptures indicate that in the beginning there was but one continent that came up out of the sea, and at the beginning of the millennium that the many continents shall be "returned to their own place" as they were before they were divided. 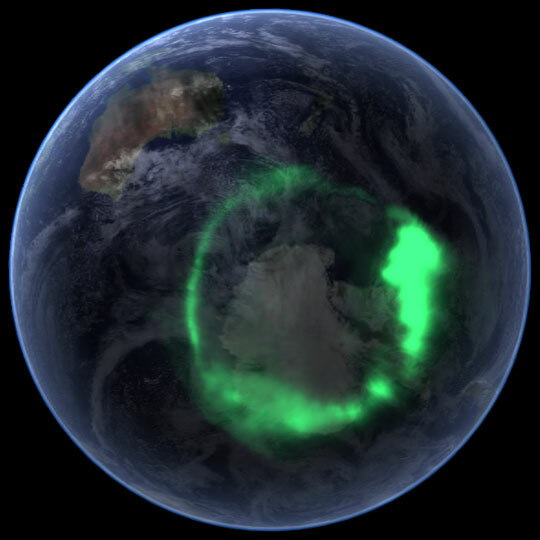 Even the earth's oceans shall be driven back into the north countries of our hollow earth where they came from at the time of Noah's flood, and the many continents and islands will become one continent again in the time of the restitution of all things. At the beginning of Christ's millennial reign, "He shall command the great deep, and it shall be driven back into the north countries, and the islands shall become one land; And the land of Jerusalem and the land of Zion shall be turned back into their own place, and the earth shall be like as it was in the days before it was divided." The mid-Atlantic ridge was probably where they were divided. It goes from pole to pole paralleling the "everlasting hills" of the Rocky Mountains that joins up with the Andes Mountains that extend even down into Antarctica and on into Inner Earth. There is a continual series of earthquakes along the mid-Atlantic ridge and around the Pacific "ring of fire" where molten lava emerges pushing the continents apart as the earth expands. Perhaps, when the earth "dies," after the short period of time after the millennium, the earth will break apart at the mid-Atlantic ridge, and then roll up like a scroll. If the earth is hollow, then earth's shell could conceivably break apart down the seam of the mid-Atlantic ridge and then roll up like a scroll at the time the earth dies at the end of the earth's temporal existence. The earth also has polar orifices that lead into its interior. The people that live in that region of the earth, the Eskimo, claim that there is a hole in the Arctic Ocean that leads into the interior of the Earth. They have accounts of Eskimos who have gone into the opening and found cousin Eskimos living within the earth. They believe that the woolly mammoth found frozen in Arctic wastes originated within the earth, perhaps because those that have been there have seen them there wandering around alive. Norwegian fishermen claim to have also gone through this polar opening in the Arctic Ocean into the Hollow Earth where they saw great herds of woolly mammoths, and describe how in winter when the Arctic sun has dipped below the horizon, that within the earth sometimes baby mammoths wander out onto the frozen rivers that empty into the polar opening where they fall into crevasses in the ice and are instantly frozen. 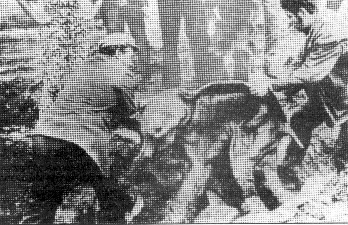 Later, when the summer sun shines through the polar orifice, the frozen rivers are thawed out and carry their frozen animals and dump them onto the northern shores of Siberia and Alaska. When these frozen mammoths are opened up, they find undigested green vegetation in their stomachs indicating they were frozen so fast the food was unable to be digested before they froze. The remains of other exotic animals have also been found entombed in arctic ice, such as the woolly rhino, steppe lions, giant deer, mammoth and foxes and a hardy breed of horse -- that originate from Inner Earth. One of the things that God describes in His scriptures that comes "out" of the earth's womb through polar orifices is the fresh water icebergs found in Arctic and Antarctic waters. The ice comes out of earth's womb through polar orifices. The Norwegian fishermen describe how great rivers dump into the Arctic ocean within the north polar opening, but the river mouths freeze over in the winter. Come summer, they thaw out and the river waters shove the icebergs out into the Arctic Ocean where they cover the entire Arctic basin. Water vapors also come out of the earth's womb from the polar orifices. These water vapors condense into ice and snow and fall onto the Greenland and Antarctic icepacks to the awesome depth of three miles in thickness! Apparently, all planets have "wombs," which makes for the possibility that planets could be "born" from the "wombs" of larger planets. If the planet Jupiter is hollow, then the "head" or north polar area would be the logical place for a planet to be "born" or ejected -- out of a polar orifice. Such an ejection could be effected by manipulating the electromagnetic fields of the two planets. A perplexing discovery was made by Apollo astronauts when they brought moon rocks back to earth to be analyzed. Prior to the Apollo moon shots, scientists had assumed that the moon was made out of the same materials as the earth. Yet the rocks brought back from the moon were found to consist of materials very different from those found on earth, containing very dense rare earth materials. Testing also determined that the moon is much older than the earth. Dr. Skousen proposes that the earth could have been ejected out of the planet where it was built by the Gods, and then was guided into the orbit in our solar system that the moon had about the sun in close enough proximity that it caused the moon to go into permanent orbit about the earth. Our Earth is literally the "mother" of men. The scriptures indicate where the original Garden of Eden is located -- within the earth's "womb." Out of the Garden of Eden flow four rivers that divide the earth into four parts which converge at the "four corners" of the earth -- at Eden. So if earth is the "mother of men" and has a "womb," then the logical place for the origin of man would be from the earth's interior. This would mean that the original Garden of Eden must be located, even today inside the earth. The sun they saw when they came out of the cave was not the same that gave them light in the Garden of Eden. Chapter XVI says that when Adam came out of the cave, he was afraid of the sun and its extraordinary heat because, "Inasmuch as while he was in the garden and heard the voice of God and the sound He made in the garden, and feared Him, Adam never saw the brilliant light of the sun, neither did the flaming heat thereof touch his body." By passing through the earth's cavern systems from the earth's "womb" inside to come to the surface, Adam and Eve were "born" into this world by "mother" earth. Their second home on the earth's surface was near the cavern that brought them here. Brigham Young taught that, "Joseph, the prophet told me that the Garden of Eden was in Jackson County, Missouri. When Adam was driven out, he went to the place we now call Adam-ondi-Ahman, in Daviess County, Missouri." (WILFORD WOODRUFF, by Cowley, p. 431) Joseph Smith was right. The Garden of Eden IS in Jackson County, Missouri, but NOT on the surface. It is located 800 miles down -- on the inner surface of the earth on the highest mountain plateau of the Inner Continent. Since Christian explorers, among them Christopher Columbus, have sought earnestly the lost Garden of Eden, it is with interest that the actual discovery should fall to a non-Christian, in fact, a worshiper of the Norwegian gods, Odin and Thor. This explorer, Olaf Jansen, actually a fisherman, has related in his book, THE SMOKY GOD, of his voyage with his father into the inside of the earth in their small sail boat via the North Polar Opening in 1829. They were taken in by the people there, taught their language and shown their country. Hence, their great discovery was brought to bear when after one year, they were taken to the capital city which the inhabitants called the City of Eden. That mountain can be seen on Mercator's map of the arctic which first appeared as a vignette in his 1569 world map. The Flemish geographer and cartographer Gerardus Mercator's methods of map-making were so accurate and reliable that they are still commonly used today (for example, the Mercator projection) and have remained virtually unchanged for nearly 450 years! His maps of Europe and the known world were exceptionally accurate and were commonly used with a great degree of reliability for navigation and commerce. Bear in mind that prior to the advent of GPS and satellite navigational aids, exploration was the sole method of acquiring the data necessary for accurately portraying geographical details on a map. So, when we view Mercator's representation of the Arctic as containing a large landmass, equally divided into four sections by massive rivers, it stands to reason that this data was acquired by means of thorough exploration. It also is apparent that, according to the perspective of the early explorers, they had no way of knowing that the land mass they were then encountering actually lay at the interior of the earth. Instead they assumed, as did many at the time, that the massive island or continent they found was actually an "island at the top of the world." 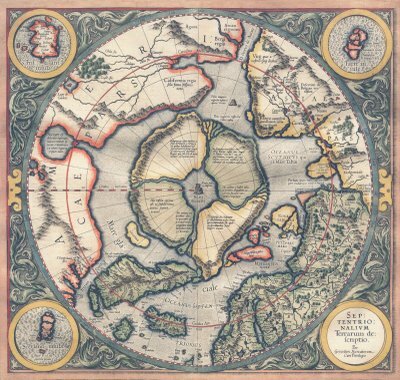 Mercator's representation of the Arctic also very closely parallels the experiences of Olaf Jansen and his father in their exploration of the inner world. So, it can be seen why and how these myths of an "undiscovered" northern region ... a land beyond the north wind came to be and how a man, so obsessed with details as was Mercator, painstakingly reproduced the knowledge he had in his possession on his map of the Arctic. In 1827, William Morgan, whose wife later became one of Joseph Smith's plural wives, was taken on a mission to Inner Earth -- most likely through the same cavern system that Adam and Eve wandered through on their journey from the Garden of Eden within to their home without. William Morgan had joined the Free Masonic movement with the intent on learning their secrets so he could subsequently publish their secret rites, which he did. As punishment for this, the Masons, had him thrown in jail for a debt, then stole him out of prison. They took him to a secluded shack out in the woods. They dug up a body that resembled him, and threw it into a river and published an account in the papers that it was William Morgan. There was a big uproar by the people that lived in the vicinity -- all neighbors of the prophet Joseph Smith -- with preachers and citizens rising up against the Masons for what they had done. But the Masons didn't kill William Morgan. They secretly took him to live as a prisoner to a cabin in the woods until he grew a long beard. They then added some chemicals to his skin and beard and hair on his head to turn it so he looked like a very old man. They then took him back to his wife, who claimed he wasn't her husband, that she had seen the dead body of her husband, and that she didn't now know him. Then the Masons took Morgan to Kentucky, near the Mammoth Cave where he was taken by an Inner Earth guide through the cavern systems to our hollow earth. Many years later, Morgan reappeared as a translated being and gave the account of his trip to inner earth. It was later published by John Uri Lloyd as Etidorpha. Bruce Walton, hollow earth researcher from Provo, Utah, discovered that William Morgan was the I-AM-THE-MAN in the book, ETIDORPHA. Revelator is with them, preparing them for their return." Dr. Clay McConkie, with B.A. in history and a Ph.D. in education, declared in his book, The Ten Lost Tribes, A People of Destiny, that after a thorough analysis of all scriptural references to the Ten Lost Tribes of Israel that the scriptures indicate that the lost tribes ..."are presently living in a locality not on the earth, but somewhere in the earth... in ...an area capable of accommodating a relatively large civilization of people and keeping them hidden from the world for more than twenty-five centuries." He points out that scripture indicates that this large area inside the earth must be where most of the water came from that covered the earth's surface at the time of Noah's flood, and that the exit point in the Arctic must also be the entrance to inner earth that the Lost Tribes took when they disappeared into the north country 25 centuries ago and from which they will someday soon reappear with great fanfare to help spread the Kingdom of God throughout the earth in preparation for the Second Coming of the Lord Jesus Christ. Some of the house of Judah are also there, because the scriptures indicate that that is where the lost and legal inherited throne of David is located. According to the Bible, the Kingdom of Israel in Palestine under King David and his son Solomon became divided at Solomon's death. The tribes of Judah and Benjamin resided in the south around Jerusalem, and the other Ten Tribes resided in the north of Palestine with their capital at Samaria. In 721 BC, Assyria conquered the northern Ten Tribes and took them into captivity. A century later, in 687 BC, when Assyria encamped outside Jerusalem to take it captive also, the record of the Jews reported that a blast from space killed all 185,000 Assyrian soldiers. They were preparing to attack Jerusalem the next morning. It was not a flame, but a consuming blast: "Their souls were burnt, though their garments remained intact," the record stated. The phenomenon was accompanied by a terrific noise. It was probably an interplanetary lightning bolt from a passing planetary body such as a comet. This event allowed the Ten Tribes to escape their Assyrian captors. Apparently, they were considering returning to their homeland in Palestine, but upon reaching the Euphrates River, they discovered that an earthquake that accompanied the blast from Heaven, had caved in the narrow canyon in the upper reaches of the river, and so the river ran dry at their crossing point. Their leaders were inspired to direct the Israelites to instead of cross the river, that they would instead travel up the dry river bed until they reached a natural caved-in dam caused by the earthquake where they climbed out. The next day, when the home-standing army of the Assyrians in pursuit reached the river, it was again flowing with the turbulent waters of the flood from the broken dam. They could see the tracks of the Israelites entering the river, but could not see where they had come out on the other side. Thus, the Lord assisted the Ten Tribes in their escape from Assyrian captivity. The Ten Tribes then continued north over the Caucasus Mountains and encamped north of the Black Sea, where many stayed. But a sizeable group continued their trek north into Russia, Mongolia and Siberia, where some of their remains have been found to this day. But they didn't stay there either. Their trek took them even further north through the northern aperture of the earth led by a prophet of God where they live today in the "North Countries" of Our Hollow Earth. The Apostle John, gave us an indication where the Lost Tribes of Israel went -- through the Earth's "mouth" into the bowels of the earth where the waters of Noah's flood had come from and subsided to. In Chapter 12 of Revelations, the "woman," which is the House of Israel, was persecuted by the "dragon" which is Satan and his followers. The House of Israel escaped into the "wilderness" of Russia, Mongolia and Siberia and passed through the earth's "mouth" into the interior of the earth 2,500 years ago where they reside to this today. To the prophet Joseph Smith, the Lord Jesus Christ revealed that the Lost Tribes have prophets, and shall lead the Lost Tribes when they come out of the Land of the North to outer earth to receive their endowments in the House of the Lord by the hand of the children of Ephraim who are the Servants of the Lord, of the Church of Jesus Christ of Latter-day Saints -- in the New Jerusalem, which Joseph Smith said they will help build. "And they who are in the north countries shall come in remembrance before the Lord; and their prophets shall hear his voice, and shall no longer stay themselves; and they shall smite the rocks, and the ice shall flow down at their presence. And an highway shall be cast up in the midst of the great deep. And in the barren deserts there shall come forth pools of living water; and the parched ground shall no longer be a thirsty land. And they shall bring forth their rich treasures unto the children of Ephraim, my servants. And the boundaries of the everlasting hills shall tremble at their presence. And there shall they fall down and be crowned with glory, even in Zion, by the hands of the servants of the Lord, even the children of Ephraim. After the Lord visited the Nephites in Ancient America, he visited the Lost Tribes of Israel in the North Countries of Inner Earth. And the record of that visit will be found in their holy scriptures when they return to outer earth to expand the Kingdom of God to all the world. Many today reject the record of the Jews, which is the Holy Bible, as the word of God, saying that it is just myth and stories made up by the Hebrews. Many more today also reject the Book of Mormon, Another Testament of Jesus Christ that testifies that He came to ancient America after his resurrection where he set up his church and taught his everlasting gospel. But when the Lost Tribes return and bring their scriptures, those that reject this third witness that Jesus Is the Christ, the Savior of the World -- will be burned at His Coming in Glory. The Lost Tribes will bring forth the political Kingdom of God to our surface world. This was the covenant that the Lord made with David: "And thine house and thy kingdom shall be established forever before thee; THY THRONE SHALL BE ESTABLISHED FOREVER. According to all these words, and according to all this vision, so did Nathan (the prophet) speak unto David." "For thus saith the Lord; there shall NOT BE CUT OFF from David A MAN to sit upon the throne of THE HOUSE OF ISRAEL." (Jeremiah 33:14-17) From this scripture we discover that there will never be a time that A MAN, a descendent of David, will not sit upon the throne of David. However, the scripture makes clear that the throne of David is now not over Judah but over THE HOUSE OF ISRAEL -- the ten tribe nation which went into the North Countries of Our Hollow Earth. The throne of David today exists in the North Countries. It is the living, legal, righteous and acceptable throne of David. The government of the Lost Tribes is a Theocracy. It is the political Kingdom of God. The prophet Jeremiah testified that a righteous branch of the House of Israel were taken by God to Inner Earth, "Behold, the days come, saith the Lord, that I will raise unto David a RIGHTEOUS BRANCH, and a KING SHALL REIGN and prosper, and shall execute judgment and justice IN THE EARTH." "Therefore, behold, the days come, saith the Lord, that they shall no more say, The Lord liveth which brought up the children of Israel out of the land of Egypt;"
When the Ten Tribes return, a portion will go back to Palestine to join the descendants of Judah there, "And I will set up one shepherd over them, and he shall feed them, even my servant David; he shall feed them, and he shall be their shepherd." The political Kingdom of God presently is headquartered at the City of Eden, in that primeval Garden where our race began, within Our Hollow Earth whose King is a descendant of David, his name is David and he sits on the inherited throne of David of old. He rules over the Lost Ten Tribes of Israel. And in fulfillment of prophecy, the political Kingdom of God under the guidance of the living throne of David will expand to the surface of the earth. A highway will be cast up in the midst of the Arctic Ocean, probably a mono-rail train on posts, which Olaf Jansen described they presently use extensively, and "their prophets shall stay themselves no longer" but will proceed to connect a permanent link between their capital city in Eden with the New Jerusalem--the future capital of the Kingdom of God in America to be built in Independence, Jackson County, Missouri. Near there, at Adam-Ondi-Ahman, Adam's home after being evicted from the Garden of Eden, a grand council will be convened. At this grand council, the resurrected Adam, and all the prophets down through the ages who held keys in the Kingdom of God, including Joseph Smith and our current living modern prophet, together with the presently reigning King David of Israel will deliver the throne of David and all the keys of the Kingdom -- to Jesus Christ who will henceforth reign as King of Kings forever more. Christ is "the root and the offspring of David." (Revelations 22:16) And thereby will the scripture be fulfilled that said that there will never be a time when a son of David will not sit upon his throne which throne will endure forever. The scripture testifies of the earth, "And truth is established in her bowels;" (D&C 84:101) It explains that truth is established in the earth's bowels because people live there who have the truth and live by it. During the Millennium there will be three world capitals of the political Kingdom of God -- Jerusalem in Palestine, the New Jerusalem in Missouri, and the City of Eden inside the "bowels" of the earth from whence the word of the Lord will issue forth to all the world. In fact, the scriptures refer directly to a people who live within the earth's crust in giant cavern cities, and to the Ten Tribes who live within Our Hollow Earth. In Section 88, verse 104, it is written: "And this shall be the sound of his trump, saying to ALL PEOPLE, both in HEAVEN and IN THE EARTH, and that are UNDER THE EARTH--for every ear shall hear..."
The scriptures teach us that Mother Earth has a heart. It is the location of Paradise, or the Heaven of this earth, where Christ's spirit went while his body lay in the tomb. He told the Jews where he would be going. Christ told them, "For as Jonas was three days and three nights in the whale's belly; so shall the Son of Man be three days and three nights IN THE HEART OF THE EARTH." Apostle Bruce R. McConkie wrote, "The Spirit World is divided into two parts: PARADISE which is the abode of the righteous, and HELL which is the abode of the wicked." (MORMON DOCTRINE, "Spirit World" p. 68) They are separated by the great gulf. 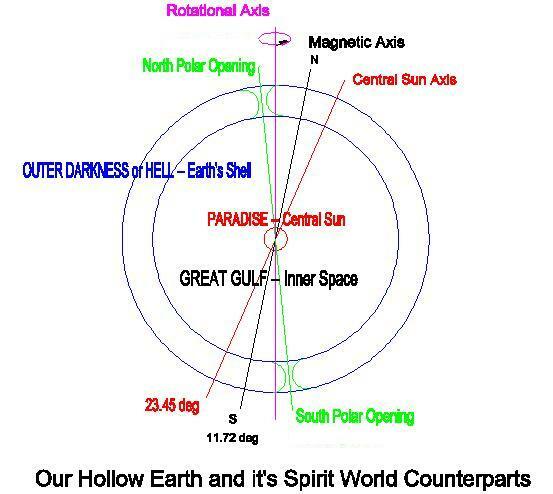 Thus, the scriptures describe a hollow spirit world, with Hell located down in the earth's shell, and Paradise in the center or "heart" of the earth in the "lower parts of the earth" separated by a "great gulf" of space. And since the spirit of all living beings have the same shape and form as their physical bodies, the physical world must also be hollow with a central sun. "Spirit Prison" would be located on the surface of the planet where spirits that haven't been cast down to Hell are waiting to hear the gospel, which if they do, and repent and receive a proxy baptism in the Temples of God, they are then empowered to cross the great gulf into Paradise. Hell, in scripture, is called "outer darkness" because it is dark underneath the surface as anyone who has been in a cavern knows, -- and because it is located "outer" or away from the center Paradise or Heaven of this earth. Many who have died and are medically resuscitated report that after leaving their bodies, they are taken through a dark tunnel through the earth's shell and then come out in brilliant light in Paradise in the center of the earth. Many Saints have achieved unto this blessing of translation. The City of Enoch, the people who repented in the time of Noah's preaching that were caught up to heaven, King Melchizedek's City of Salem, Elijah, Moses, Alma the Younger, many Masters of the Far East, the Three Nephites, and the Apostle John, the Beloved of the Savior, all have partaken of this blessing wherein the righteous that are cleansed from all sin and wickedness may fore-go death and be caught up to Paradise to become translated beings by partaking of the fruit of the Tree of Life in a special gift from the Savior. Jesus Christ revealed to John that, "To him that overcometh will I give to eat of the tree of life, which is in the midst of the paradise of God." (REVELATION 2:7) Many who have died and were medically resuscitated report that after passing through a dark tunnel through the earth's shell, they arrive in Paradise in the heart of the earth and see a City of Light in the distance. That City of Light in Paradise is the City of Enoch that was physically taken to Heaven -- buildings and all -- many years before Noah's flood. It will return to the earth's surface at the beginning of the millennial reign of Jesus Christ when Heaven and Hell will change places. When we look at the Earth, it may seem to be just one big lump of rock covered with some dirt and water. But if we look at it from God's perspective, he describes the earth as having two separate parts. Notice that "heaven" and "earth" here are both singular. From this we learn that our Earth consists of TWO parts, a "Heaven," and an "Earth." "And God said, Let there be light; and there was light." Now, since God placed the Sun, Moon and Stars on the 4th Day of Creation, the question that must be asked is, "What lit up on the first day of creation?" God goes on to describe this light that he lit up on the first day of creation. "And God saw the light, that it was good; and God divided the light from the darkness. And God called the light Day, and the darkness he called Night. And the evening and the morning were the FIRST DAY." Here we learn another characteristic of this light, is that God divided it into a light side and dark side. How unusual. What light could have a dark side so that is causes Night? The phrase, "The evening and the morning were the First Day" indicates that this light rotates. Then God, describes this light even more. "And God said, Let there be a firmament in the midst of the waters, and let it divide the waters from the waters. And God made the firmament and divided the waters which were under the firmament from the waters which were above the firmament; and it was so. And God called the firmament Heaven. And the evening and the morning were the SECOND DAY." Here we learn that this light is in the midst of the waters of the earth, and it actually divides the waters below it from the waters above it. How unusual! What kind of light could be suspended between two oceans of water? Then God describes where this light is located. He says it is located in a "firmament." The word "firmament," translated from the Greek means "expanse." The dictionary says firmament means, "sky, considered as an arch." A characteristic of an arch is that it is curved. Apparently, God is describing something that is curved, is in the sky, and it separates an ocean, or "waters" above it from an ocean, or "waters" beneath it, and is an "expanse." What is more, God gives this expanse a name. He calls it "Heaven." This part of the creation occurred on a separate day from the first day, so this firmament must have been an important part of the creation of the earth. Where could this expanse, firmament, or Heaven be located? There is a pattern in God's creations. Take an atom, for example. It has two separate parts -- the nucleus and the electron shell. And they are separated from each other by a considerable space. In other words, an atom is hollow. It has a nucleus suspended within the center of its electron shell. Our sun is located at the center of the solar system surrounded by orbiting planets. And if we look out into space we see many similar creations -- all having a central star surrounded by orbiting stars and dust. It seems that all of God's creations have this pattern. If we would consider that our earth is built with a similar construction, with two separate parts, one inside the other, then we can begin to understand the Creation account in Genesis. The "light" that God lit up on the first day of creation is the core of the earth, or the "heart" of the earth. And it shines. This is the discovery made by polar explorers. Through polar openings in the Arctic, at the "end of the earth" they have seen through an "empty place" in the earth's shell. And what do they see? An inner sun shining within the hollow of our earth! This inner sun produces a solar wind that emanates out through the polar openings to light up the auroras at both poles. And our astronomers report that most of the planets in our solar system have been found to have auroras at their poles just like earth. The Norwegian fisherman-explorer, Olaf Jansen, described this inner sun in his book, The Smoky God. "One day about this time, my father startled me by calling my attention to a novel sight far in front of us, almost at the horizon. 'It is a mock sun,' exclaimed my father. 'I have read of them; it is called a reflection or mirage. It will soon pass away.'" 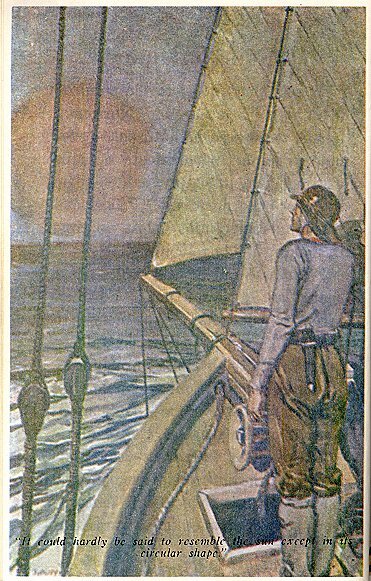 "But this dull-red, false sun, as we supposed it to be, did not pass away for several hours; and while we were unconscious of its emitting any rays of light, still there was no time thereafter when we could not sweep the horizon in front and locate the illumination of the so-called false sun, during a period of at least twelve hours out of every twenty-four." "Clouds and mists would at times almost, but never entirely, hide its location. Gradually it seemed to climb higher in the horizon of the uncertain purply sky as we advanced." "It could hardly be said to resemble the sun, except in its circular shape, and when not obscured by clouds or the ocean mists, it had a hazy-red, bronzed appearance, which would change to a white light like a luminous cloud, as if reflecting some greater light beyond." Fridtjof Nansen saw a mirage of this inner sun when he was caught in the ice on his ship, the Fram, in February 1894, at 80 degrees 1' N Latitude. He reported, "Monday, February 19th... Both today and yesterday we have seen the mirage of the Sun again; today it was high above the horizon, and almost seemed to assume a round, disk-like form." He remarked that it had a hazy, smoky-red color. As the Norwegian fishermen explorers, Olaf and his father Jens Jansen passed through the North Polar Opening to Inner Earth, they met the Inner Earth inhabitants who were very friendly to them. They were very large in stature, very refined, highly educated and were in many respects as fair and similar in appearance to North Europeans. In fact, his father considered them his cousins. He told Olaf, his son, that their Norwegian legends told of a country in the far north that was a terrestrial paradise where the "Chosen People" lived. They were cousins, descendants of some of his ancestors, whom Norwegians worshiped, such as Odin, and Thor, whom now they considered to be Gods. Similarly, members of the Church of Latter-day Saints consider some of their ancestors to be Gods also. Members are taught that they are "modern" Israel, many of which are actual descendants of the tribes of Israel, and if not, all who join the church are adopted into the House of Israel -- and if they live their lives righteously, taking upon themselves the sacred covenants with God of baptism, and covenants of His holy temple, they become worthy of all the inherited blessings God promised to their ancestors, Abraham, Isaac and Jacob, whose name was changed to Israel by an angel of God. To the prophet Joseph Smith, Jesus Christ revealed, "I am the Lord thy God, and will give unto thee the law of my Holy Priesthood, as was ordained by me and my Father before the world was. Abraham received all things, whatsoever he received, by revelation and commandment, by my word, saith the Lord, and hath entered into his exaltation and sitteth upon his throne. Abraham received promises concerning his seed, and of the fruit of his loins—from whose loins ye are, namely, my servant Joseph—which were to continue so long as they were in the world; and as touching Abraham and his seed, out of the world they should continue; both in the world and out of the world should they continue as innumerable as the stars; or, if ye were to count the sand upon the seashore ye could not number them." In fact, the righteous of any age can become Gods, if they live God's full law -- which is Celestial Marriage performed by authorized servants in the Holy Temples of God. "And again, verily I say unto you, if a man marry a wife by my word, which is my law, and by the new and everlasting covenant, and it is sealed unto them by the Holy Spirit of Promise, by him who is anointed, unto whom I have appointed this power and the keys of the priesthood; and it shall be said unto them--Ye shall come forth in the first resurrection; and shall inherit thrones, kingdoms, principalities, and powers, dominions, all heights and depths--then it shall be written in the Lamb's Book of Life, that he shall commit no murder whereby to shed innocent blood, and if ye abide in my covenant, and commit no murder whereby to shed innocent blood, it shall be done unto them in all things whatsoever my servant hath put upon them, in time, and through all eternity; and shall be of full force when they are out of the world; and they shall pass by the angels, and the gods, which are set there, to their exaltation and glory in all things, as hath been sealed upon their heads, which glory shall be a fullness and a continuation of the seeds (children) forever and ever." "Then shall they be GODS, because they have no end; therefore shall they be from everlasting to everlasting, because they continue; then shall they be above all because all things are subject unto them. Then shall they be GODS, because they have all power, and the angels are subject unto them." "Verily, verily, I say unto you, except ye abide my law ye cannot attain to this glory." "For strait is the gate, and narrow is the way that leadeth unto the exaltation and continuation of the lives (posterity), and few there be that find it, because ye receive me not in the world neither do ye know me." In his sojourn in the hollow earth, Olaf Jansen was very interested in the inner sun and gave several descriptions of it. He called it, "the Smoky God," because the Inner Earth inhabitants, he reported, believed it was the throne of their "Jehovah." Here, it is curious that he would mention that the Inner Earth inhabitant's God was Jehovah -- the God of the ancient Israelites, because Olaf and his Father were worshipers of the Norwegian Gods, Odin and Thor, to their dying days. He wrote, "In the meantime, we had lost sight of the sun's rays, but we found a radiance 'within' emanating from the dull-red sun which had already attracted our attention, now giving out a white light seemingly from a cloudbank far away in front of us. It dispensed a greater light, I should say, than two full moons on the clearest night." He further wrote, "The great luminous cloud or ball of dull-red fire--fiery-red in the mornings and evenings, and during the day giving off a beautiful white light, 'The Smoky God,'--is seemingly suspended in the center of the great vacuum 'within' the earth, and held to its place by the immutable law of gravitation..."
All living things have been found to have an electromagnetic field about them. It is sometimes called an "aura." So, the fact that the earth has an electromagnetic field could be an indication that it is alive. Similar to a dynamo, the earth produces an electromagnetic field because it has two parts, both with electrical charges, one rotating about the other. Olaf Jansen reported that the inner sun appeared to be stationary, however, it does rotate very slowly -- originally it was once every 1,000 earth years, but since creation, the earth's rotation has slown down, and has been pushed into an orbit further from the sun, so that the inner sun now rotates about once every 623 years. Similar to a magnet, the magnetic flux emerges from within at the south magnetic pole, and enters again at the north magnetic pole, which means that within the earth, the directions of the compass are opposite ours on the surface. This is what Olaf Jansen discovered. Their compass continued to point north even after passing through the north polar opening into Inner Earth. Some people have thought that Olaf's description of how the inner sun appears to come up in the morning in the east and go down in the west, was an indication of the falsity of his story. But they didn't think about this carefully enough. Since magnetic flux flows out of the earth at our south pole, and goes in the north pole, and continues towards the south pole within the earth, then our south pole is their north pole and our north pole is their south pole. Since the earth rotates from west to east on the outside of the earth causing the sun to appear to rise in the east in the morning. and the directions of the compass are opposite inside the earth, then the inner sun's bright "day side" cloud would appear in the east in the morning as seen from the inner surface of the hollow earth, and appear to go out on the west side in the evening so that the dark side of the inner sun then appears for night time. God's Genesis account appears to now make sense. The light that lit up on the first day of creation was a different sun that our outer sun that was placed in the sky on the 4th day of creation. (Actually, the earth was probably just put in orbit about the sun so that the sun, moon and stars then appeared in the sky.) That "light" that lit up on the first day of creation has a day and night side, and rotates once for every day of the Lord, which God told Abraham was once every 1,000 earth years. That "light" that lit up on the first day of creation is an inner sun suspended within the "expanse," "womb," or hollow of the earth. It is the "heaven" or "heart" of this earth, and "paradise" of the spirit world of earth. We, as inhabitants of earth, can be grateful to God, our creator, Jesus Christ, and His Father for such a nice place to live. And we can have great respect for our "mother" earth knowing that she is alive, and obeys God's will. In fact, God's prophets have taught that our earth after its resurrection, will be the celestial kingdom for those of us found worthy to live on and in it. Jesus taught his disciples, that the "meek" will inherit the earth. "Blessed are the meek: for they shall inherit the earth." (Matt 5:5) John, the Beloved, saw the death of the earth and its resurrection in his Revelation. "And I saw a great white throne and him that sat on it, from whose face the earth and the heaven fled away; and there was found no place for them." Notice the special mention of "the earth and THE heaven, " again "heaven" is singular. The celestial city, the New Jerusalem, that John the Beloved saw, is being build right now inside our outer sun by Jesus and his Saints and Prophets. Phoebe Marie Holmes in 1933, told in her book, My Visit To The Sun, of her visit to the Celestial City of God within the Sun. She described how she was taken in the Spirit by angels to the heart of the Sun where the New Jerusalem is today being built. It will be brought to earth after the earth's resurrection when the earth becomes celestialized and becomes the abode of the righteous. Since it is so big, 1,500 miles long, wide and high, it will probably take the place of the earth's inner sun in the celestialized earth. Christ, on his Sermon on the Mount said, "In my Father’s house are many mansions: if it were not so, I would have told you. I go to prepare a place for you." A mansion is being built there right now for each of us, in the New Jerusalem, by our actions here on earth. Phoebe was taken by the angels of God to visit her unfinished mansion, where she found her husband, who had already passed on. She then was brought back to earth to finish her life's work. Phoebe reported that the city in the Sun is a giant terraced mountain with a square bottom -- having a pyramid shape. John, the Beloved, in Revelations 21 reported that the New Jerusalem is as long and wide as it is tall and gave the measurements, which in our units of measure comes to 1,500 miles, with a wall 1/2 mile thick. So perhaps the ancient Meso-Americans, Chinese and Egyptians knew the New Jerusalem would have the shape of a pyramid, and so built their temples with that shape. The angels told Phoebe that the Sun is a giant crystal. Joseph Smith also taught, "The angels do not reside on a planet like this earth; But they reside in the presence of God, on a globe like a SEA OF GLASS AND FIRE, where all things for their glory are manifest, past, present, and future, and are continually before the Lord." "The place where God resides is a great Urim and Thummim." Scientists, on the other hand, claim the Sun is entirely gaseous. But if it is hollow and has a shell thickness 10% of its planetary diameter, -- that would give the Sun's shell a density of 2.9 gm/cc, and so would have a solid surface! Glass has a density of 2.6 gm/cc. The scientific work of Michael Mozina at his website at http://www.TheSurfaceOfTheSun.com, presents considerable evidence that the sun has a solid surface covered by some kind of liquid, perhaps silica. In recent satellite images of the sun in various wave lengths, surface features such as mountains and hills can be seen. He even shows a movie on his website taken by satellite of a "sun quake" on the surface of the sun, which sent out a tsunami from it's epicenter and you can see the waves passing over the mountains. This evidence that the Sun has a solid surface indicates the Sun is a hollow globe -- since it does not have enough mass to be solid all the way through. And it's not that hot inside the Sun as scientists claim either. Phoebe described a nice warmth is provided for the celestial city suspended within the Sun's hollow interior. "The earth will be cleansed again. It was once baptized in water. When Christ comes, it will be baptized with fire and the power of the Holy Ghost. At the end of the world, the earth will die; it will be dissolved, pass away, and then it will be renewed, or raised with a resurrection. It will receive its resurrection to become a celestial body, so that they of the celestial order may possess it forever and ever. Then it will shine forth as the sun and take its place among the worlds that are redeemed. When this time comes the terrestrial inhabitants (those living terrestrial laws, Phoebe said would be taken to the Moon) will also be taken away and be consigned to another sphere suited to their condition. Then the words of the Savior will be fulfilled, for the meek shall inherit the earth." The Meek are those living celestial laws--which includes baptism in the true church of Jesus Christ and subsequent righteousness throughout this life. Faith in the Lord Jesus Christ, repentance, baptism by an authorized servant of Jesus Christ and reception of the Gift of the Holy Ghost, and continued living "by every word that proceedeth out of the mouth of God." (Matt 4:4) are the requirements for entrance into the Celestial World. Indeed, our LIVING earth is alive, and will continue to be our home forever -- if we are worthy of such a great an honor. After the resurrection, our Living Earth will become a Celestial World for its righteous inhabitants and will take it's place as a Star -- another of God's jewels shining in the vastness of space.